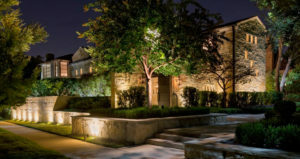 Landscape lighting is an essential and positive feature of any property. It can provide safety, set a tone, and even a raise a property’s value. Landscape lighting is a lighting solution that provides light and ambiance throughout all four seasons and provides homeowners with a sense of joy of awareness. Here are the benefits of landscape light installation in Kansas City! Landscape lights can raise a property’s curb value considerably. They can be soothing, guiding, or even inspiring. During the holiday season, they can bring holiday cheer and brightness. Christmas light installers in Kansas City understand that lights are a great source of joy for a lot of families, and wish to bring that joy to Kansas City families. Your landscape lights can bring that same joy. While Christmas lighting is only installed for a season, landscape lighting can be installed and left indefinitely. Landscape lighting brings Kansas City holiday cheer and brightness all year round. Landscape lighting can provide assurance and safety to a lawn or property. Whether your landscape lighting helps guide cars down your driveway or draws attention to your roof or some other aesthetic, landscape lighting provides a sense of assurance and safety to any property. Landscape lighting installers understand the importance that proper lighting can have on a property. Whether you’re interested in installing landscape lights in your front lawn, back lawn, or driveway, safety is a priority that landscape lighting provides.